Speaker: Jane McNamara's talk about "pet trusts"
About 5 hours, near Lancaster. RSVP Marcy HorsingRound@att.net for location and/or last minute changes. Free to BCHC members, $10 for non-members. RSVP Marcy HorsingRound@att.net for location and/or last minute changes. RSVP Kelly Carle 944-1621 for directions or last minute changes. This is the trip you want if you’ve always wanted to pack, but are just not ready to go camping on your own. We will reserve the Forest Service Cabin and Cow Camp. You have your own vehicle and trailer. You attend the orientation meetings (dates TBA). Or get an exemption, call Paul for details. This is a great desensitization ride. Frequently seen on the trail are joggers, walkers, bicycles, strollers & dogs. Frequently seen near the trail are picnics, music, golf & vehicle traffic. There is a Mexican restaurant right on the trail with hitch rails. The one dining room has windows so we can keep an eye on our stock. Optional lunch afterward at Viva Cantina, margaritas available there! 900 Riverside Drive, Burbank, 91506. 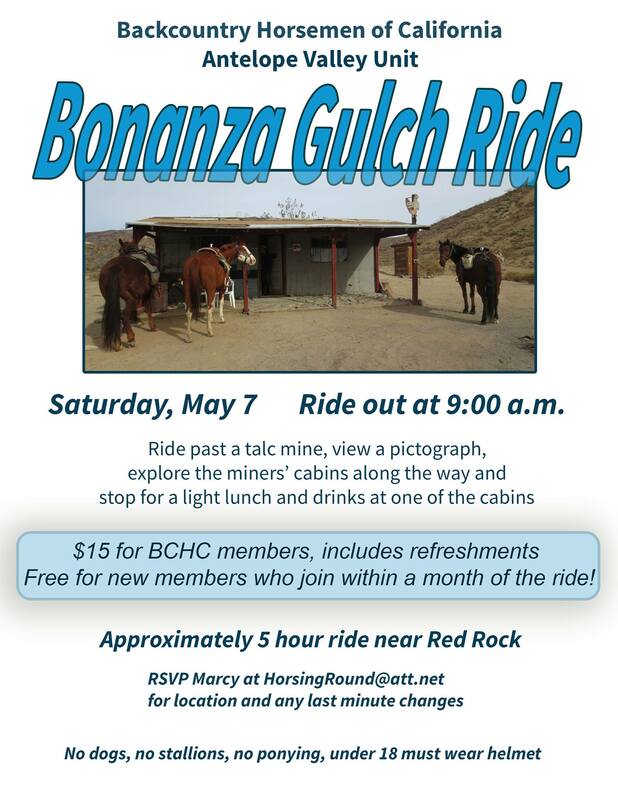 Bickel Camp Ride & Mining Camp Tour - Open to non-members! Everyone is invited to the (Barrel Springs) Arena dedication at 2:00 on Wednesday March 7. The arena at Tejon Park will official be known as the Sergeant Steve Owen arena. The address is 1300 E Barrel Springs Road. It is north of Pearblossom Hwy. between Sierra Hwy and 25th Street East. Please come on horseback, in uniform if you represent a group or on foot. You could go on a trail ride before or after. This is the trip you want if you’ve always wanted to pack, but are just not ready to go camping on your own. We will reserve the Forest Service Cabin and Cow Camp. We have picked dates for our annual camp trip to the Sierras. There is a $5 ($4 for seniors) charge to park. Cash only. 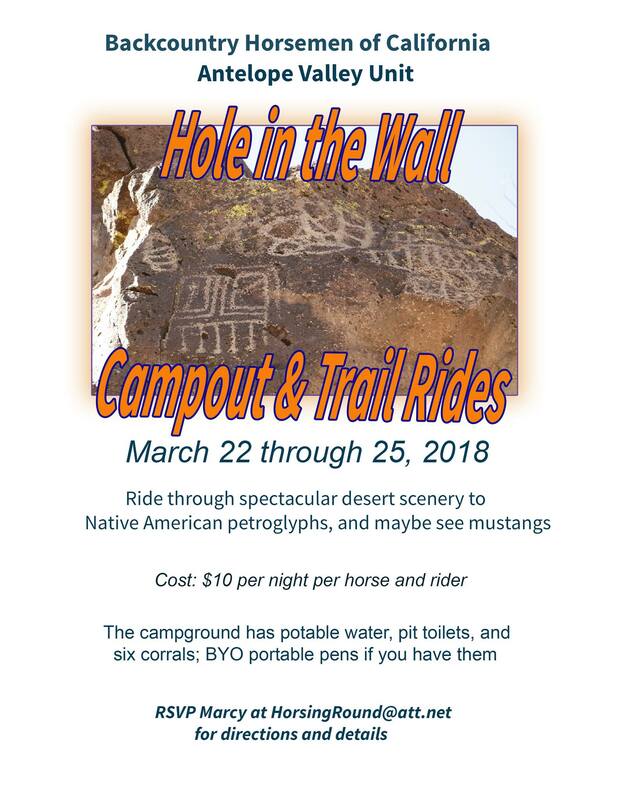 Backcountry Horsemen of California is sponsoring our Youth Educational Camp-out at Montana do Oro Horse Camp this year June 15,16,17, and 18. Join our Los Padres Unit ($60 whole family, $50 individual, $15 youth 18-25, under 18 free) and camp with your horse(s) any or all of Thursday thru Sunday. Fabulous trail riding! The Educational Event and Trail Trials will be on Saturday only. This day is open and free to the public. Adult campers will will pay $25 for Friday and Saturday night BBQ meals in camp. Near Lake Los Angeles. Approximately 13863 East Avenue Q.
RSVP June by phone or at jfrisbey@gmail.com for directions and/or last minute changes. A beginners’ pack trip; learn to pack from your own members! 2.5 - 3 hour ride from the trailhead to the cabin. You attend the orientation meetings (dates TBA). Or get an exemption, call Paul for details. About 4 hours. (We will stop for lunch.) Near Lake Los Angeles. RSVP to June by phone or email for directions and/or last-minute changes. Volunteers will choose duties and form groups. Dress for the weather and wear work gloves, please bring tools; pitch forks, shovels or rakes. Springville Forest Service Office on Hwy 190 in Springville. 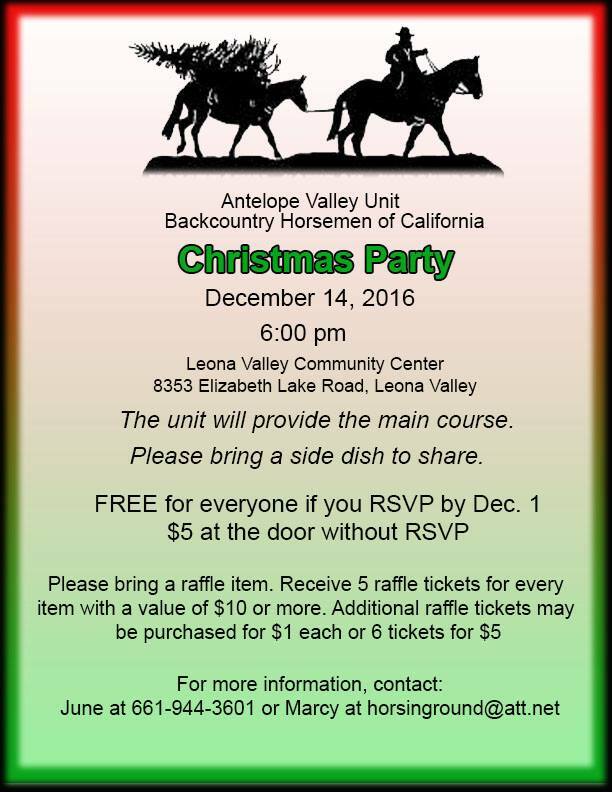 You have to be a member (regular or associate) of the Sequoia Unit of Backcountry Horsemen of California. Calaveras Fair Grounds (www.frogtown.org) in Angels Camp, CA. Poppy Ride! Open to non-members! Near Red Rock - We will start at a staging area off Burro Schmidt Tunnel Road, which is about 30 minutes north of Mojave, south a ways from Ridgecrest. Trail Coordinator: Unless I can find another trail boss, the June 12 ride will be cancelled. The trail boss will be helping with the annual joint venture (BCHC, USDA-FS, BLM, FFA) to take High School students into the back country and teaching trail maintenance and meadow management. We have picked dates for our annual camp trip to the Sierras.We will be leaving on Monday, July 18 and returning on Sunday, July 24. Lazy T Ride - Open to non-members! Lunch will be provided if riders RSVP, else $5 at the door. Free for Veterans! $10 for BCHC Members. $20 for non-members. Includes refreshments! 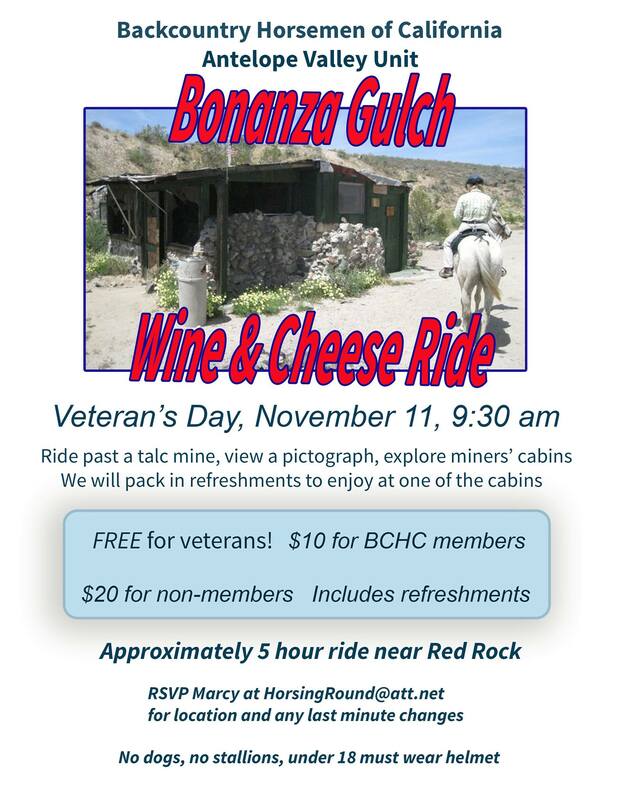 RSVP to Marcy at HorsingRound@att.net for location and any last minute changes. Main course provided by our unit. Please bring a side dish to share. Join in the Solo Cup Raffle fun. Bring a raffle item worth $10 or more and receive 5 raffle tickets. Tickets available for purchase too. Attendees please bring an unwrapped gift of any value to donate. "DEDICATED TO THE GENTLE USE OF CALIFORNIA TRAILS AND BACKCOUNTRY"